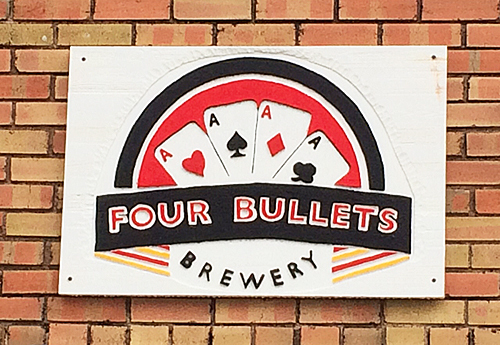 Within the first minute of his guided tour, brewmaster and co-founder Andrew Smeeton states what may already be obvious to anyone walking through the door; Richardson's new Four Bullets Brewery is the smallest production operation in the Dallas-Fort Worth area. Now, had Four Bullets opened a couple of years ago that might not have been the case, at least if the comparison was based on the size of its brewhouse. Square footage-wise, though, it's certainly got the tightest quarters of any new brewery that's opened since 2011. So, how small is small? The five-barrel brewing system and adjoining taproom take up less than 1400 square feet. Being little isn't a bad thing, by any means, and some will tell you they prefer a more intimate atmosphere like that being offered at what is Richardson's first production brewery (Kirin Court, a dim sum restaurant in the city, produces their own house beers as a brewpub). For one thing, tours are a small-scale affair, which generally affords you more of an opportunity to interact with the person actually brewing your beer. On top of that, you're also likely to experience a little more depth in terms of the discussion as to how that beer gets brewed. In any case, the brewery does have more room to work with, given there's a slightly smaller adjacent area that is not currently being used, but for now patrons can hang out inside and drink by the fake fireplace (and the TV), or head outdoors where picnic tables are available for you to sit and partake of your pint. Out back is also your best bet for parking, incidentally, since it's an easier in-and-out than the parallel options on the street. The entrance, brewhouse and bar at Four Bullets Brewery (click to enlarge). As for the name Four Bullets, if you're not already aware, it's derived from a poker hand of four aces, with the gaming theme extending not only to the miniature playing cards used as drink tickets on tour days (Saturdays 12-6 p.m.), but also to the beer. Along those lines, the brewery's opening hand of three beers consists of Black Jack Brown, Two Pairs Pale Ale and Royal Flush Red. All are easy drinkers brewed with an English flair, a nod to Smeeton's home country, and if I had to pick a favorite I'd probably go with Royal Flush Red. It's a light, smooth beer with a bready malt backbone and just a hint of bitterness in the finish. Other brews rotate week-to-week in the taproom, with beers like Big Slick ESB, Beer Hand Bitter and Snake Eyes Oatmeal Stout all making appearances over the past few weeks. Another, All In IPA, is also on the way, something co-founder Jeff Douglas said wasn't necessarily in the brewery's initial plan. He and Smeeton started the venture favoring malt-forward recipes, but over time they've both grown to appreciate hoppier beers. Of course, they also know the style is a crowd-pleaser. In terms of distribution, being small they'll naturally handle the job themselves. For now, they're primarily servicing accounts right around their neighborhood (The Line Bar & Grill, Tavern on Main Street), but they have branched out for launch events outside the city. More than anything, though, they want to be known as Richardson's hometown brewery, so it's assumed they'll continue to play their cards close to the vest for the foreseeable future.